Look, I’m all for sustainable living and renewable energy sources, but I don’t let them get between me and a taste. Fortunately, most of the time, I’m drinking from reusable pint glasses or recyclable cans and bottles — so a little wastefulness here and there won’t break my moral bank. And these disposable wine glasses are just too ghetto-fabulous not to love. According to our old friend Matt over at Crave, the inventor of this disposable stemware actually took it on a show dedicated to finding cool new products, and it was rejected. The joke’s on them; they’re blowing up over in the UK. At £2.25 a glass (~$3.40) they’re not exactly cost effective, but neither is buying a Rainier for $4 at a bar downtown — why do I do that? And cost aside, the real advantage is in the simple fact that it’s sealed and good to go. 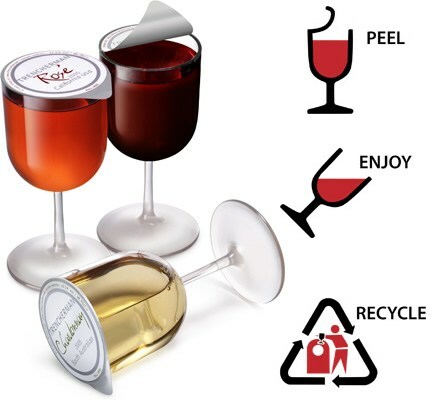 The foil top is like a yogurt container’s, keeping your wine fresh and your legal status legit. No need for unsightly paper bags! Just wait till the fuzz goes by, pop the top, and enjoy a nice glass of… Le Froglet?! What kind of name for a wine is that?